I’ve been thinking about it for the last 20 years. I had no idea that this was a remake/revision or restyling of a Korean cult movie from 2003. When I read the opinions quickly, all the art-loving movie audiences are outraged and say it’s a useless, failed, and terribly bad version of the original movie. May well be, but then again I have the advantage that I’ve never seen that Korean version, and probably never will see it. I don’t like Asian movies that much. Mostly they are technical abominable looking creations with terribly nervous little Asians who are running around all the time. And there is the insurmountable language gap so I am obliged to look at the subtitle all the time. I’ve already tried to watch an Asian film and notice that I always end up with a sore thumb because I’m pressing all the time the rewind button. And besides, the original movie by Chan-Wook Park is actually a movie version of a famous Japanese manga. In fact, Spike Lee’s version is also a reinterpretation of the same comic. 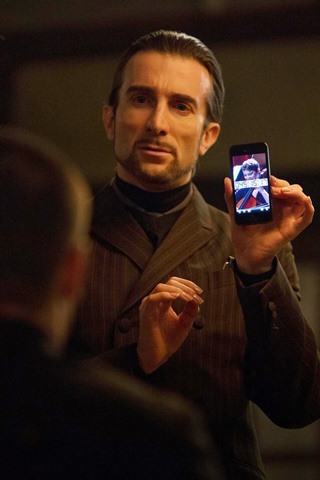 Eventually, this “Oldboy” turns out to be an outright duplicate of the Korean version. There are some explicit scenes left out and apparently the denouement got a slightly different interpretation. Besides, I don’t understand why you would watch this remake when you think that the original is so divine and matchless impressive. I have the same issue with the Swedish film “Män som hatar kvinnor” which I think is sublime. I don’t think I’ll ever watch the U.S. version “The Girl with the Dragon Tattoo“, because I foresee that I won’t approve of it. 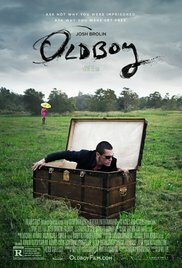 Is it possible that if you watched the U.S. version of “Oldboy” before the supposed masterpiece from Park, the result could be that perhaps you’dd appreciate both ? Seems to me that it’s a foregone conclusion that this movie wouldn’t do justice to Park’s version. What if the U.S. version would be directed by Steven Spielberg with Will Smith starring in it (seems that was the initial plan) ? Would that be okay ? I admit that the build up was pretty confusing and I repeatedly had the tendency to turn it off. The reasonable long period of his incarceration made it look like an art-house film with the metamorphosis of a person in captivity shown painfully slow. The claustrophobic images, anger, helplessness, sorrow, rehab, the sometimes frenzied and insane behavior with images that were shown in different positions and perspectives, weren’t signs that this would be an exciting and action-packed movie. But after this section a lurid and insane put together story began that eventually degenerated into a kind of Oedipus tragedy. Shortly after his release, Joe eliminated an American Football team in a highly effective and cold-blooded brutal way. What started was a “Quentin Tarantino”-like spectacle , with no-nonsense explicit violence. The fight scene in the corridors with a large gang was extremely meticulous imaged with a smart choreography . I rewinded it three times purely for pleasure and because it was fun. Sure it felt like a revived Bud Spencer movie , but that made it more fun to watch it all. I actually grinned and laughed about it. Josh Brolin was perfectly casted for this role. The drunk marginal figure that turned into a bloodthirsty Kill Bill in 20 years, was played in a convincing way. The final denouement where he comes to realize how the fully developed plan was put together and where he made the decision to give up his freedom, was masterfully and convincingly mapped. Samuel L. Jackson was also perfect as the sadistic business manager of the obscure little hotel. However, Copley didn’t impress me as the ailing Chucky. The only not so realistic thing I could think of in this ingenious and surprisingly put together story, was the fact that he mastered a martial art in 20 years. Agreed, he had time enough for it, but I don’t think you can learn these fighting techniques by just watching a television broadcasts. Conclusion: a lurid, bloody and sometimes excessive revenge movie with a perverse denouement (a remark made by my wife) with an impressive Brolin in the leading role. For those who think that Park’s movie is unmatchable: cherish it whatsoever. Perhaps a Park adept would look at this one in a different way if he hadn’t seen Park’s version (as mentioned before). For me it was an original and unusual movie.